(Photo Courtesy/Mike Beiermeister) Erv Lewandowski (left) and Mark Beins (right) discuss their artwork in their new exhibit "Two Artists Sharing Space." 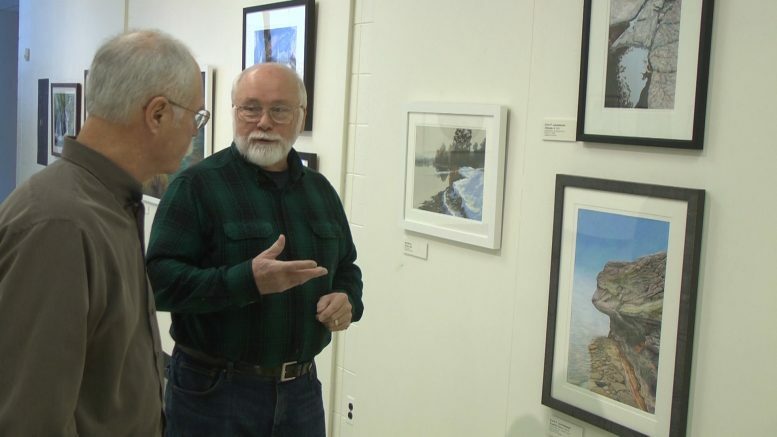 Alpena, Mich. — This weekend, a new art exhibit is coming to Alpena’s Besser Museum for Northeast Michigan. “When you walk in and you’re hit with the white, these pieces are gorgeous,” said Beins about his first look at the completed gallery. What makes this gallery unique is the layout and sizes of the pieces. Lewandowski usually creates smaller pieces, crafted from his colored pencils. Beins gravitates towards larger artwork. The two have a unique bond. Both are Sunrise Side artists. They both focus on capturing the smaller details of nature that are easily overlooked. For Erv and Mark, this is an opportunity to inspire curiosity in those that explore their work. “When someone walks out of a gallery and wants to look, wants to observe, and wants to understand more, whether it’s our subject matter or not, that’s my goal,” said Beins. The exhibit opens this Saturday at the Besser Museum. A reception will take place from 3:00 p.m. until 5:00 p.m. It is free and open to the public. Guests can register to win a Lewandowski print. The exhibit runs until April 15th. For more information, visit the Besser Museum’s website at www.bessermuseum.org.